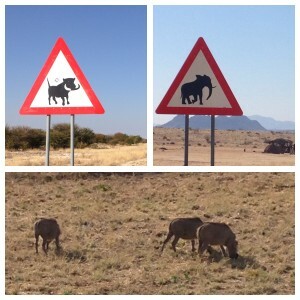 How can’t you love a country where the roads have signs warning of elephant, warthog and antelope crossing? All of which, including ostriches, we’ve seen while driving down a main road. The one that was really impressive was a huge kudu that crossed in front of our car only to find himself in front of a 4 foot fence. I readied my camera thinking it would turn around and I would get a great shot of its face. Effortlessly this beast, in one move, gracefully jumped the fence and continued its stroll. Not only did I miss the shot but I then wished I had the camera in video mode. 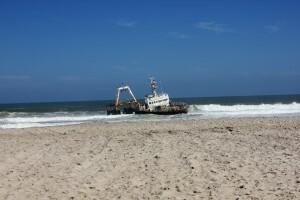 The one area of the country that we didn’t see any wildlife on the road was the drive up the Skeleton Coast. Not only did the barren and isolated coastal road lack animals you can drive for hours without seeing another car. 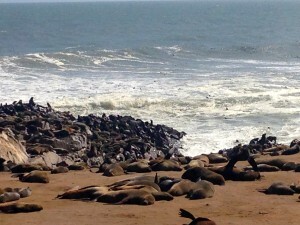 If you stop in Cape Cross there is a fur seal colony (or eared seals) where up to 100,000 seals can be seen lounging on the rocks and playing in the rough sea. But while on the main road the only thing to be seen in the water are shipwrecks, which add to the eerie isolated feel of this famous stretch. The landscape changed drastically as we drove inland toward the central part of the country. 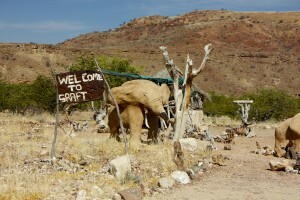 The mountains in the area are where the ancient rock carvings can be found sharing the area with the desert elephants. When we arrived we were disappointed to hear that we were just minutes too late to join the elephant tour. 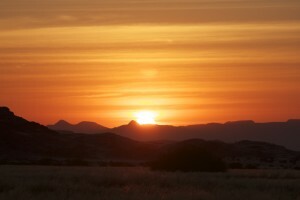 So we set off to see some sights and then found a place to photograph Africa’s huge orange ball as it dipped below the horizon. 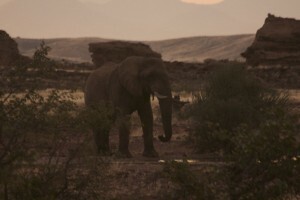 Then we got lucky, returning to the lodge with photos of another beautiful sunset to share, we ran across a desert elephant. I was told these elephants are different because they have bigger feet from walking on the sand and they can survive long periods of time without water. This particular elephant saved us. We had planned on taking an organized tour for $100, but thanks to our spot we didn’t have to. 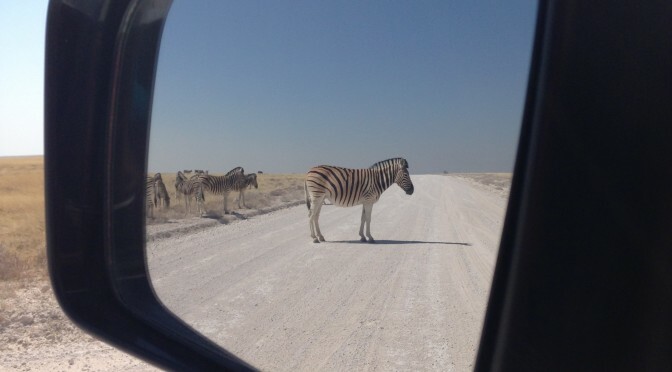 Driving Namibia is easy and there’s always something to see. Whether it’s a person selling handmade crafts, animals along the road or just the beauty of the ever changing landscape. 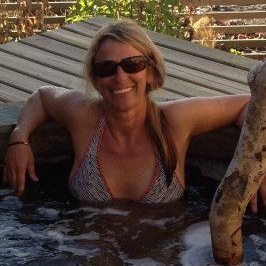 One of the least populated places in the world offers a warm and wonderful experience.